With all the civs there are in the game, it's a pitty to have no more than five building sets. And there are a lot of really cool building sets out there, like Carcoma's, But how to use them without replacing any existing one ? As usual, backup your files ! This is very important in case something goes wrong. I advise reading my other article so you know the basics with AGE. Add the graphics to the gamedata_x1_p1.drs file and save it. 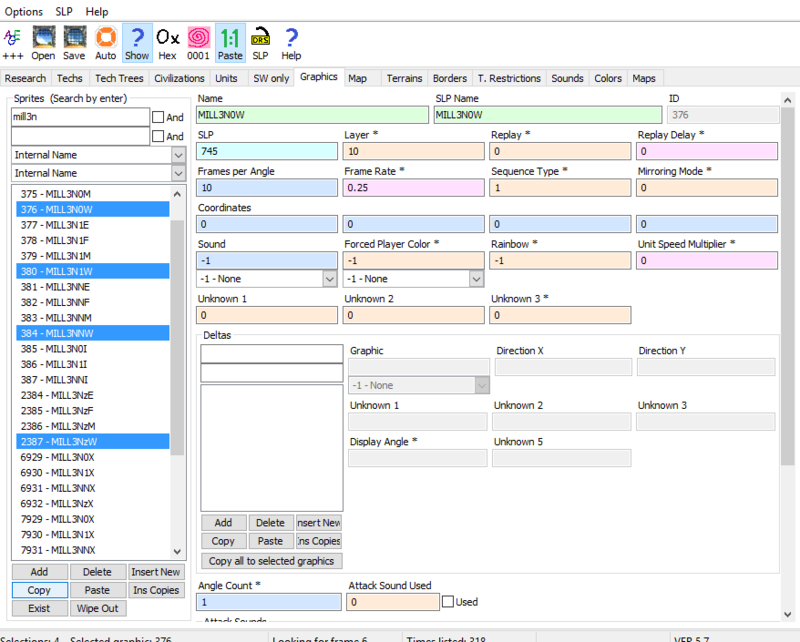 Then when you open AGE, don't forget to check the box "Path for drs", it enables AGE to display the graphics of the game. In AGE you will notice that there are one building for each age. There are for example 4 archery ranges, how to know which one is linked to which age ? There is a simple way : in AGE, there is a box called Name at the top, it is the internal name of the unit. For the archery range it's ARRGx, x going from 1 to 4. 1 means Dark age, 2 Feudal age and so on. The same goes for all buildings, just look at the number in the internal name and you will know which age it is linked to. For example ARRG3NNW is the West Europan castle age archery range. We'll start with all the static buildings, the easier ones. 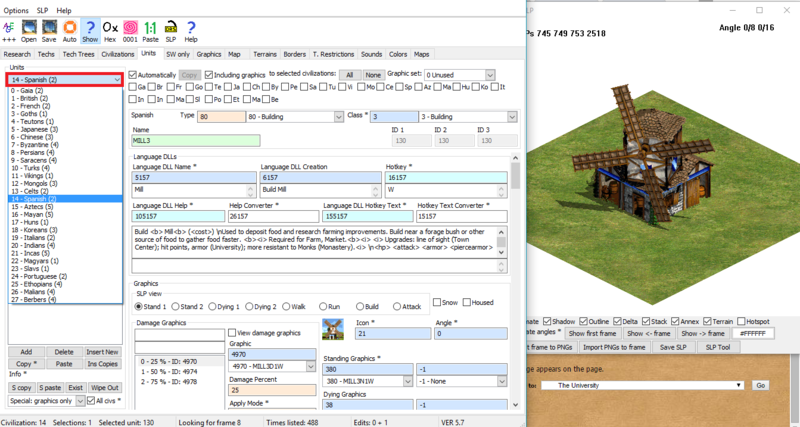 First in the unit tab look for the standing graphics of let's say the archery range, then find it in the graphics tab and copy it. Change the SLP number to the one of the new building graphics. It should display the new spanish archery range. That was easy right ? Well it's not totally done yet, some graphics have seperated shadows and this is the case. Look for a shadow graphics (they finish with N0E, N0W, N0F, N0W) for example ARRG3N0W, copy it, change its slp number to the archery range shadow one. Then go back to the building graphics, in the delta box press on add twice : you have added two slots for delta graphics. Leave the first one empty, and change the second one ID to your newly created archery range shadow (and eventually correct its position using the X and Y direction boxes). Now your building is ready to be used ingame. That one was not that hard, but when it comes to animated buildings such as mills, docks and blacksmith it is not the same story. Relax, nothing very complex in the end but we will have to work slightly differently. When you look at the slp for the mill you will notice that there are one for the building itself, one for it's shadow, another one for the animation and a last one for the animation shadow. We just need to see how to pu them together. It has 3 delta graphics : the first one is the building's shadow, the second is the animation's shadow and the last one is the building graphics. MILL3N1W contains the animation graphics. Now that you have understood how to use delta graphics, you should be able to create new graphics for every animated buildings. You think you're done right ? Well not yet, there are still two buildings that we should take a look at, and they are definitely the most complex one. Town centers are made of several units stacked together, and each unit is made of a standing graphic using delta graphics. Still not lost ? Then you can go check Vardamir's article, it contains everything you need to know about gates and TC's graphics, and you should be able to create new graphics using his infos. It's nothing more than using delta graphics, it's just that there are a lot of them. 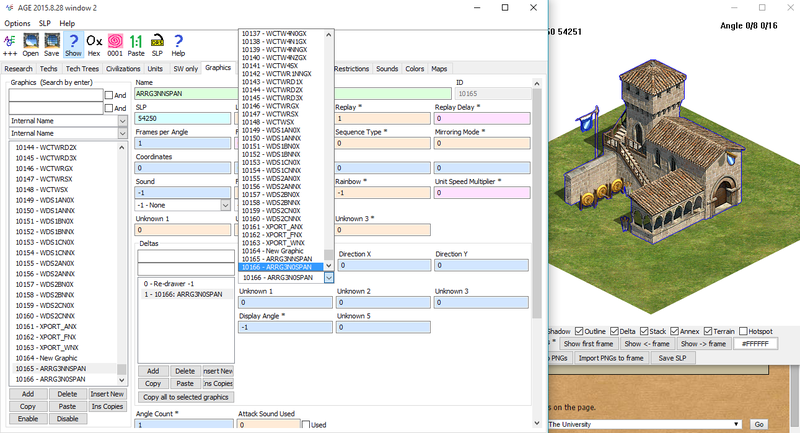 Once you are done with the graphics part, making them specific to one civ (or more) is easy : go in the unit tab, select the building you want, in the civilization bar select one civ you want to have your new building set. I hope this article helped you, if there is any point that seems unclear to you feel free to ask me for more explanations. Hello, thank you for making a guide, can i still play multiplayer on aoe2hd after creating a new style for my civ or will it be like an expansion to the game so that everyone must have the same mod or can i get banned? Thanks Sam, I'm trying to give new modders a fairly complete step by step tutorial so that they don't have to rediscover everything by themselves. @danyyy : I should have mentioned that to play multiplayer all the players must have the same data file, otherwise you will desync. Hello TriRem! I am very much new to modding, so if you dont mind then can you tell me which folder do you specify in the path name for drs files? There are many subfolders. You might need to do some trial and error to figure out which subfolder you need. Thanks for the speedy reply Leif Ericson! I will try and report the folder name. EDIT:Can you please tell me the location of language x1 and p1 files too? I searched thoroughly but to no avail. I think if I remember correctly you should edit the modded file and not the original, otherwise the game won't run. This is exactly what I was looking for.Thanks. Now I can have more than 10 individual architecture sets. Hi! First of all, thank you by this clear and useful information. In the past, I've been close to AOE modding and I successfully changed the user interface and added a unit to my forgotten expansion. For adding a building, I'm having issues. I modified my gamedata_x1_p1.drs file as it says on the "beginners' guide to adding graphics to the game" and added my new slp files. When I try to find those graphics in AGE they just don't appear. What could be? I've been dealing with this for many hours. Please help! Hey, sorry for the late response. Are you trying to make a mod in the Steam version or the old Forgotten Expansion mod that is available for the CD version? If it's for the Forgotten Expansion mod for the CD version, I would double check the file paths you are using when you start AGE. I believe the filepaths to the .dat file, the DRS folder, and the language files should be in this folder: C:\Program Files (x86)\Microsoft Games\Age of Empires II\Games\Forgotten Empires\Data. You might have to modify them if your game is installed in a slightly different location. If it's for Steam, I believe you copy your .slp files into the C:\Program Files (x86)\Steam\SteamApps\common\Age2HD\resources\common\drs\graphics folder. You can also copy them into the gamedata_x2 folder for good measure. I haven't done any modding for the Steam version, so I'm not as certain about which folder to copy them to. Steam doesn't use a gamedata_x1_p1.drs file. I hope this helps. If not, let me know and we'll see if we can figure out what isn't working. Thank you Leif. I am using the old mod for the CD version. I know that the important files are hosted on /Age of Empires II/Games/Forgotten Empires/Data. I just discovered that if I try to open the paths just like that with AGE it will crash and close the app. The way to deal with this, is by setting AGE like if you are choosing the age of empires regular data folder. With AGE opened, you have to click open again and now select the forgotten data folder. 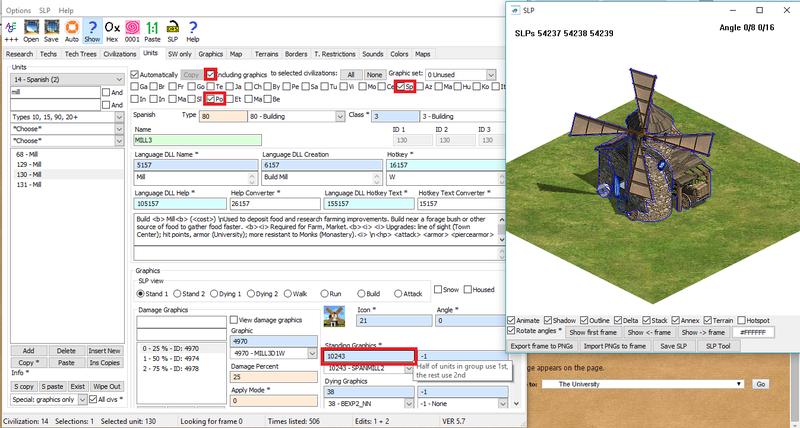 Also, I just found that for adding files, you actually have to copy the exact procedure meant for units: copying an existing building on a just added file and then, in the graphics tab, modifying the existing slp file. If you look for your files in the graphic files, you won't find them. I think this is not totally clear at the other posts. Hope this info is useful. Looks like you found a solution. I'm glad!